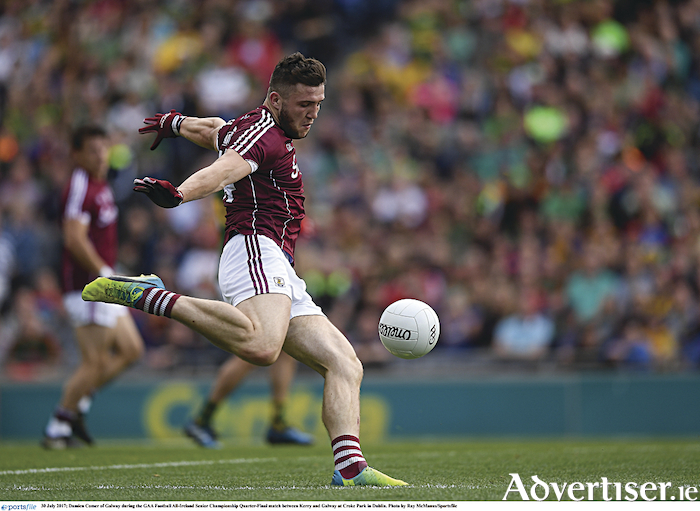 Galway’s key corner forward Damien Comer will hope to be in full flight for Sunday’s NFL opener in division 1 against a tough Tyrone side. My grandfather John Francis Silke, who lived and farmed in Corrandulla, Co Galway, used to tell me when I was a youngster that as you get older the years really start to race by. When you are over 50, the years begin to feel more like seasons rather than the full value of 12 months. Not that I am there, just yet. However, when you are nine or 10 years or age, that logic does not make much sense. Time seems unlimited and his were the musings of a man in his seventies, utterances to be cast aside and ignored. That young boy was wrong though; his grandfather was right. Tempus Fugit. The years are flying by. I cannot grasp the number of people who have mentioned already this month that it is 20 years since we won the All-Ireland in 1998. I can do the sums, but perhaps my brain just does not want to. Is it really 20 years since we observed and admired the current Galway senior football manager dominate all challengers around the middle of the field, and collect his first of three All-Stars? Is it really two full decades since stunning forwards like Joyce, Fallon, Savage and Donnellan thrilled Galway football supporters with their pace and sheer class, and Mannion and De Paor sallied up the field like thoroughbred stallions out for a gallop? It is, and we must accept the reality that sporting years go by at a rate of knots, and championship seasons and national leagues almost seem to overlap. And here we are again at the start of a new campaign with Kevin Walsh now entering his fourth year in charge of the Galway seniors, and even those few seasons at the helm of Galway football seem like a bit of a blur. Intercounty management is a tough station and it takes a massive commitment in time and energy. It has an endless job description to which few would have the courage, mental fortitude, or inclination to sign up. Next Sunday Walsh and his management team kick off the NFL with a tough encounter against Tyrone, who have been moving well in the Dr McKenna Cup in Ulster and who will be quietly confident of collecting both points in Tuam Stadium (2.30pm ). Their championship ended badly last year when they were battered by Dublin and went down by 2-17 to 0-11 in the All-Ireland semi-final. Since then, their on-field leader Sean Cavanagh has retired, and his brother Colm is unlikely to be around this weekend either, due to club duty with Moy. Mickey Harte will be looking to Peter Harte, Padraig Hampsey, Cathal McCarron, Tiernan McCann, Niall Sludden, Delcan McClure, and Mattie Donnelly to lead the way for his team this weekend. Galway are also short of the usual players - some 11 players who saw action in their championship defeat last year to Kerry. Cillian McDaid has moved to Australia. Corofin players, Ian Burke, Bernard Power and Liam Silke are club tied, while Gary Sice, Michael Meehan and Finian Hanley have all retired. Michael Daly, Fiontán Ó Curraoin, Danny Cummins, David Walsh are all injured. Seán Armstrong and Gary O'Donnell, although still on the injured list, are reported to be making good progress and might be able to make the panel. Galway, having played a few games in the FBD League, might look to players such Seán Andy O'Ceallaigh, Peter Cooke and Sean Kelly who have caught the eye. However it is to their experienced players, such as Paul Conroy, Damien Comer, Shane Walsh, Gareth Bradshaw, the Sweeney twins, Declan Kyne, Johnny Heaney, Eoghan Kerins and Eamon Branigan, who will be expected to take the fight to the Red Hand. The referee on Sunday is Ciarán Branagan (Down ) and he can be fussy at times and does not usually let the game flow too much. Tyrone are 2/1 favourites to win with the home side available at 2/1 and, considering the list of players unavailable to Galway, those odds are understandable. With Donegal (away ) and Mayo at Pearse Stadium coming up in the following fortnight, it is crucial Galway get off to a good start and get something out of this Sunday's clash. Galway have not been in division one for a good few years and it is important that they try to consolidate their position in the top flight to improve their competitiveness against the top six or seven teams in the country. Two points on Sunday would be a great start in trying to achieve that objective.